Will France hand over Chinese religious refugees to their persecutors? Home » CAP LC activities and reports » Will France hand over Chinese religious refugees to their persecutors? 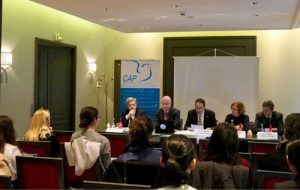 CAP CL (12.03.2018) – On 9 March 2018, CAP Liberté de Conscience held a press conference in Paris about France’s rejection of applications for asylum filed by Chinese refugees belonging to the Church of Almighty God. Several scholars and representatives of human rights organizations gathered to expose the dramatic situation to which these asylum seekers will be submitted if they are sent back to China. The well-known Prof. Massimo Introvigne, Director of the Center for the Studies of New Religions (CESNUR) presented the Church of Almighty God from a scholarly perspective, insisting on the fact that several university studies and expertise have demonstrated and confirmed that most of the accusations against this Church were false and were the product of Chinese propaganda. Mr Willy Fautré, the director of Human Rights Without Frontiers International (HRWF) presented disturbing statistics about the number of asylum denials concerning members of the Church of Almighty God in European countries, and particularly in France. Mrs Marie Holzman, a well=known sinologist, writer and journalist who is a specialist of contemporary China and Chinese dissidence, described the political roots of the persecution of religious minorities in China and explained the socio=psychological context which might have created some misunderstanding between the asylum seekers of this Church and French institutions. Mr Eric Roux, President of the European Interreligious Forum for Religious Freedom, (EIFRF) analyzed the difficulties faced by asylum seekers in France and the way French authorities can mistakenly rely on outdated or false information when they take negative decisions. The participants have also watched a video in which two members of the Church of Almighty God testified about the persecution, imprisonment and torture they were victims of in China. Mr Thierry Valle, President of the Coordination des Associations et des Particuliers pour la Liberté de Conscience, CAP LC, and organizer of this event, announced that a Call to President Macron had been launched by a group of human rights organizations, scholars and other personalities to inform him about the tragic consequences entailed by the denial of asylum for the members of this Church in France and to urge him to make sure that they find a safe haven in France.